Traditionally, the inhabitants of Tard can be regarded as Matyo people, but according to regional opinions these people are more likely to be a remnant of the Tatars than Matyos. The memory of the Tatar conquerers are also kept in the name of the Tatár Hill, which stands near the village. Besides, the Tardian name used for the roof of the regional house is "Tatar tent". 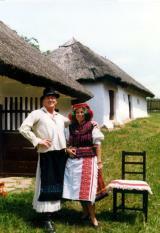 Just like the conventional architecture, the Matyó folk costume is also dying out from Tard. We can mostly see the old style shawls around the grannies' shoulder. Their children often get on the bus whilst carrying their special back-bag, but their grandchildren are wearing jeanes when running home from the school. They can only learn about those old days when the pieces of the former costume are discovered in the worn-out boxes.